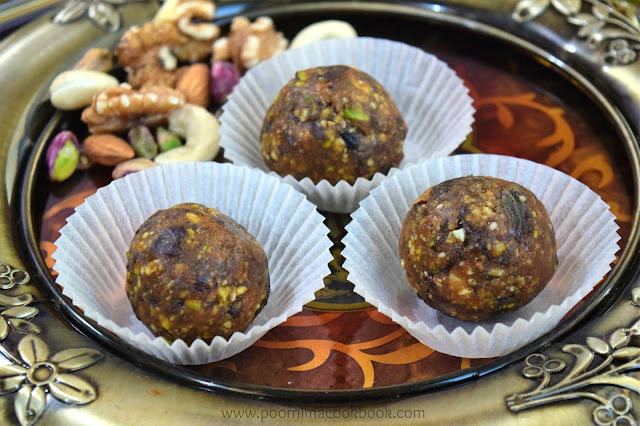 Dry fruits ladoo is an easy to make & tasty sweet and the most important is that it is without any added sugar! 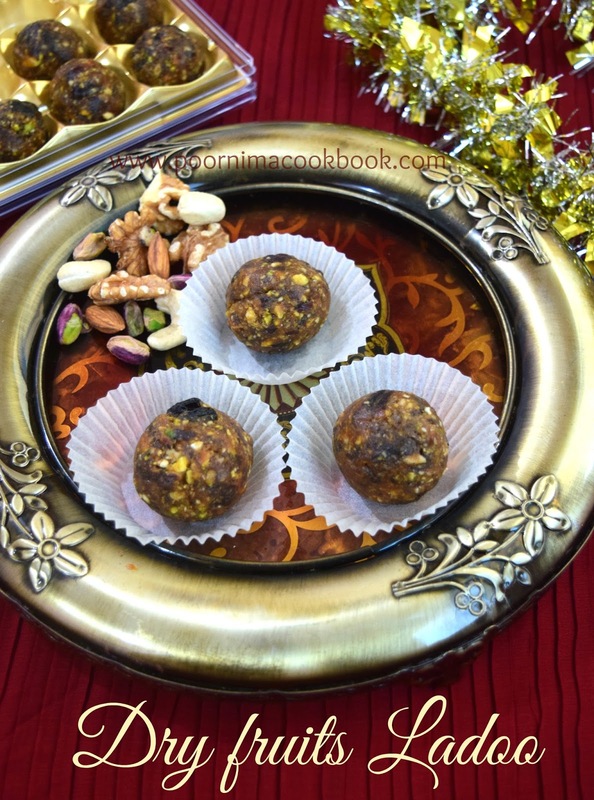 This ladoo is highly nutritious with all natural goodness. It is also suitable for festive seasons and we can indulge without guilt! Dry roast the nuts and keep aside. Make sure not to burn it. Once it cooled; grind it into coarse powder an keep aside. Grind dates and raisins (without adding any liquid) into paste. Heat ghee in a pan, add the grounded dry fruits(dates & raisins). Saute this mixture in low flame it becomes soft. Now add cardamom powder and nuts powder. Mix well, till it combined well with dates mixture. Switch off the flame. Allow to cool. Grease your palm with ghee, take a small portion of date and nut mixture and make it into medium size balls. This ladoo can stay fresh in room temperature for 3 - 4 days. After that you can refrigerate and use. 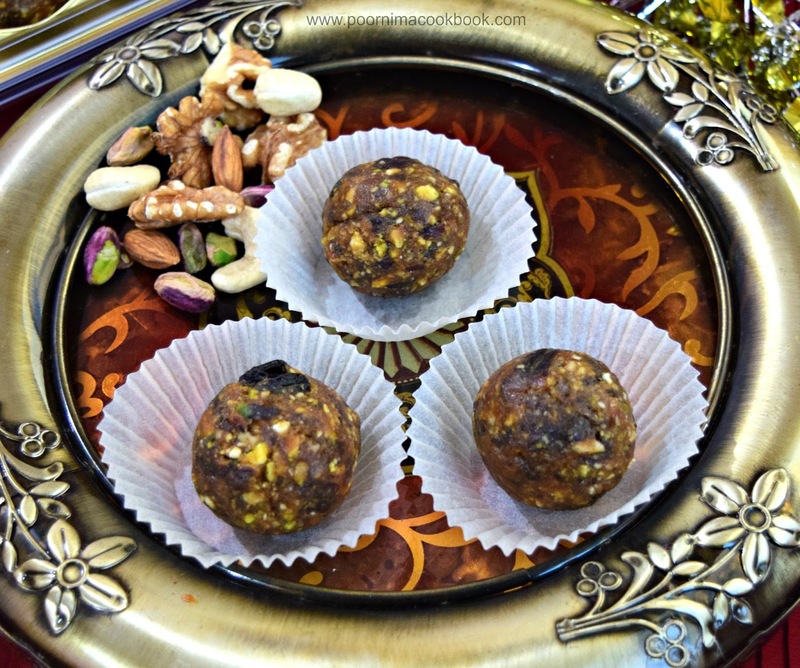 You can also add dried figs to prepare this ladoo. You can also roll this ladoos in dessicated coconut / nut powders. You can choose the nuts varieties to suit your preference.